How does technology affect your emotional stability? Picking up a copy of Daniel Goleman’s book Emotional Intelligence is almost a requirement in the business world for educating yourself on the topic – but in terms of improving your emotional skills, does stepping back from the internet help or hinder your relationships (both online and off)? When we started our Digitox, such a thing couldn’t have been further from my mind. We just wanted our family to connect with each other rather than their gadget, and got fed up with the constant zombie behaviour worthy of a place in the movies rather than a family home. One piece of research for my book on our Digitox showed that excessive internet use causes lateralisation of brain function, the process by which the division of labour between both hemispheres becomes increasingly unbalanced towards the left hemisphere – away from more holistic creative thought and towards more logical, process-driven thought processes. Given that high levels of emotional intelligence are attributed to a more balanced thought process, there should be a correlation between a lower level of emotional intelligence and a higher use of the internet. Likewise the reverse should be true – so when we took ourselves and our children off the internet for one day a week (and limited evenings too) four years ago, we started to see changes in our emotional intelligence as a family. Luckily Mr Goleman gives me a nice framework of reference to consider and four distinct areas to explore. Those with high levels of emotional self-awareness are very much in touch with their own emotions and instincts. Our family’s drop in internet use has seen improvements in our self-awareness, particularly in our eldest, who is 18, and in myself. By burying ourselves in our screens, it became increasingly difficult to have awareness of external surroundings or inner emotions. In a spiritual sense we silenced the voice within by over stimulating in other ways; for example, by gaming, shopping or choosing to stream the same TV series over and over again. Our ‘hard stop’ brought a great deal of emotion at first (more on that shortly), but the time and space we gave to focus on our family created a positive change in this area. There are a number of facets to examine here: self-control, adaptability, achievement orientation and positive outlook are the ‘business’ classifications. This is where we’ve seen the greatest difference within the family. Have you tried to take away an iPad from a six year old after hours spent exploring its delights? What happens? In almost every case the withdrawal of this particular ‘toy’ will cause a far greater level of tantrum than any other. Taking away the internet from a teenager causes pretty much the same level of angst. Why? Because addiction has developed. In younger brains this occurs faster, but nobody is immune – from infant to grandparent. Our children’s ability to step outside of online social pressure has led them to be far more socially aware, both virtually and in the ‘real’ world. This lack of self-control was unexpected when we first started our Digitox, and has become a thing of the past as we broke the addiction and formed more healthy habits. Adaptability to these changes has taught my children to be more proactive in finding alternative entertainment – typically in the creative space. When your drive is focused on internet consumption and gaming, then the idea of achievement orientation is not focused on education or work. We’ve seen dramatic increases in school results over the last four years in our eldest three (now 18, 15 and 13) – and we attribute this to higher levels of self-awareness, lower addiction and improved creative skills. Less time on screens and more time for homework doesn’t hurt either! You may believe that social awareness is the one thing that the internet gives us, but this has been one of the most troubling areas of our family experiment. Defined as empathy and organisational awareness in business, in a social setting this is where our greatest parental concern lies. A short time ago, her boyfriend posted a picture to Instagram of Jessica in a dress, it was a lovely picture and he put “Appreciation post for my girl” as the caption (don’t judge the spelling, focus on the sentiment). Both of them have their accounts locked to ensure that only their friends can follow them, and both are aware that I expect to be able to see their activity, and his parents do exactly the same. As you can see from the screen capture below, the responses were mostly nice and funny – except for one. 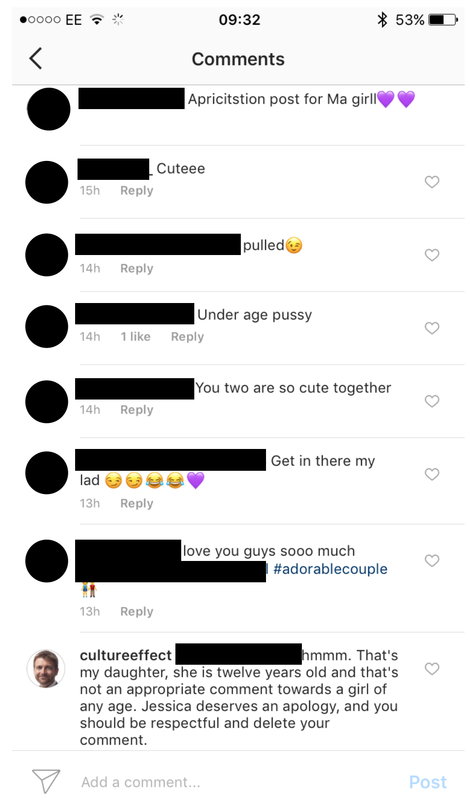 I’ll draw your attention again to the fact that these are 12 and 13 year old children. The boy in question was entirely unknown to me, a friend of Jessica’s beau, and he removed the post three minutes after I made mine. Let’s just leave aside the fact that many people saw the comment (and that Jessica clearly had heard such things before) and focus on the exact words used. Creepy in every way. Jessica’s boyfriend called her to apologise on behalf of the offending individual, and blocked him. I talked to her boyfriend’s parents a couple of days later, and although they had missed this particular post, they did know the child who had made the comment. They, in turn, had a conversation with his parents about it. The old saying “it takes a village to raise a child” seems just as applicable in the digital age. Our internet free days (and evenings) create a collaborative environment that was generated through force of circumstance at first but has long since become habit. The overwhelming pressure to be connected, and the fear of missing out (FOMO) means that when I head to the kitchen in the morning I often see Snapchats and messages on the children’s phones that were sent long past one o’clock in the morning. Remember some of these kids are as young as 11. This means that any school life cannot be separated from home life. Any troubles follow home, and the school social that I used to be able to leave behind is now a 24x7 activity. Imagine if you were permanently connected to work – we all know how harmful that can be. Our children’s ability to step outside of this pressure has led them to be far more socially aware, both virtually and in the ‘real’ world. Finally, we get to relationship management – the conflict management and leadership areas are where we’ve seen the clearest improvement. By placing a rule on TV streaming that three or more have to agree on what to watch, we have helped generate an environment of compromise, which is no mean feat with four children. This ability to collaborate and resolve conflict has not only made our lives as parents much easier, but has also given each of them tangible benefit in school. Our eldest became head boy, our next is currently a prefect, and my daughter is part of the school council. How much of this benefit is truly due to our Digitox? There is no way of telling. But as parents we can recognise changes in our own children – and I wrote the book to share our experiences and the benefits it brought us. Mark Ellis is the author of Digitox: How To Find A Healthy Balance For Your Family’s Digital Diet, a book all about making yourself and your family happier, healthier, safer and smarter in a society that increasingly demands constant, unsustainable attention. He now spends time helping large innovative corporations get the best from their people as a leadership & culture consultant and shares his experiences at Oxford Brookes University as an Associate Lecturer. He is also a professional conference chair, working alongside production teams to provide a safe pair of hands and ensuring a consistently professional (and engaging) experience for delegates and speakers during events. Mark has been a guest on BBC Radio 4’s flagship Today program, BBC Radio Oxford and Jack FM and together with his family has also been featured in the national press, both in the UK and the USA - and in other publications including Grazia and Oxford Life Magazine. He has been married to Caroline for twenty years, and together they have four children and a dog called Shelby. His best selling book, Digitox is the story behind Mark and his family’s decision to create “Tech free Sunday’s”. A day where there is no Internet usage – by choice. Meaning no email, social networking, texting or You Tube. Not even checking the weather forecast. The book covers their experiences over a three-year period and highlights the challenges; benefits and the pitfalls that they feel could have been avoided.